The Great Buddha (Daibatsu) at Kotoku-in Temple is easily the best-known site in Kamakura, a historic city just down the coast from Yokohama and Tokyo. Mark and I visited there in 2010, and the kids and I went there this past August. Even though giant Buddha gets the most attention, plenty of other sites in Kamakura warrant visits. 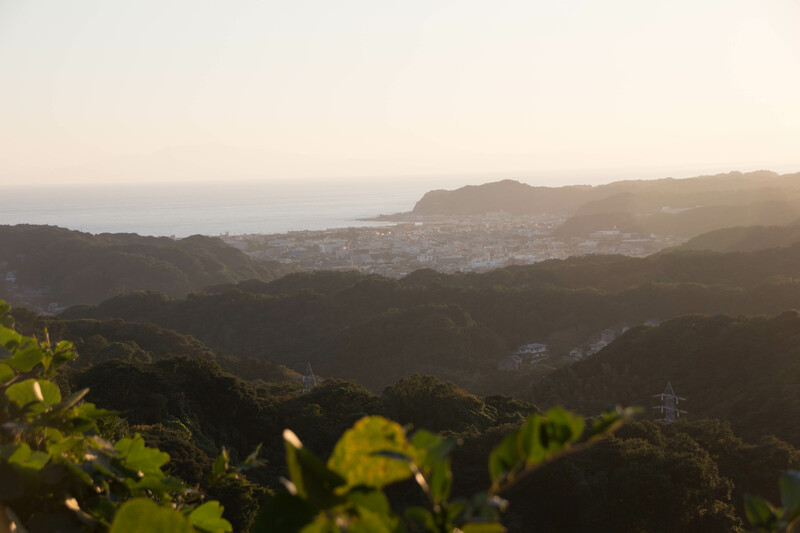 Dozens of Buddhist temples and Shinto shrines sit in and around Kamakura, and hiking trails connect the sites both through the city itself and the hills above. 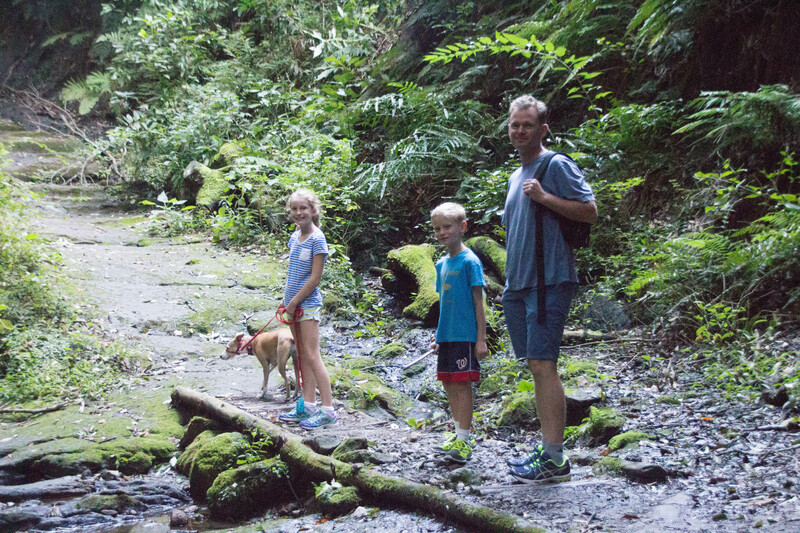 This past Saturday we set out for such a family hike in Kamakura with our pup, Ruby. An American friend who has lived in Japan for over twenty years gave some pointers on good hiking routes with dogs, so off we went. Normally one sets out at an early hour to beat the crowds, or the heat. Not us! We didn’t hit the road until 3PM. I could lie and say that we had a grand plan to arrive right as the crack-of-dawn crowds started to leave town. But really, we had a busy morning followed by a lazy afternoon, and we finally got our act together well after lunch. 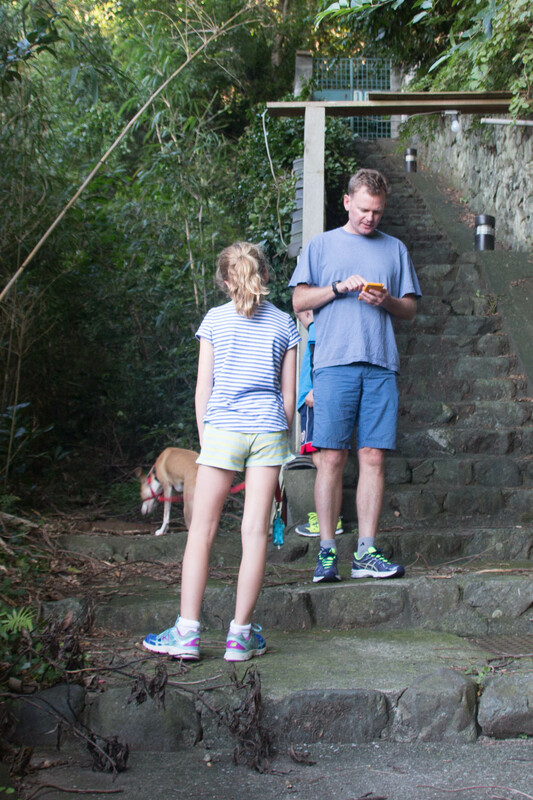 Hiking in Japan without Japanese reading skills means staring intently at Google maps. A lot. We drove the 35 minutes and arrived ready for a vigorous stroll. Unfortunately we had no actual printed hiking maps or books, and what we pulled up on our phones didn’t really help. 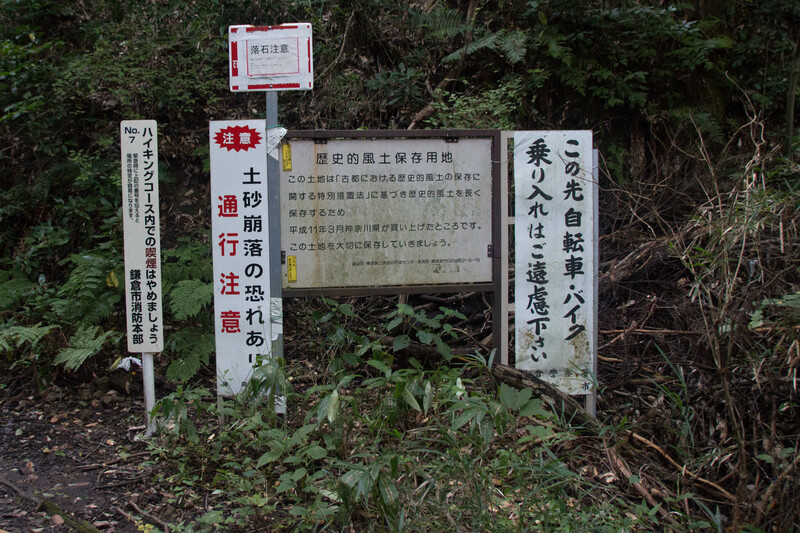 We also had no idea whether we were even close to where we intended, since signs in Japan tend to be written in kanji. Go figure! We spent a lot of time staring at Google maps on our phones and wondering whether we were close to where we thought. We quickly decided that it didn’t really matter. We simply intended to get the kids and the dog outdoors on a beautiful day, whether we walked along residential streets or in the hills. A trailhead! We think. Darn that kanji…. We started walking past homes and generally pointed ourselves uphill. And magically, a trailhead appeared! At least we think it was a trailhead. It was hard to say since, once again, the sign was in kanji. So we headed into the forest and up the hill. 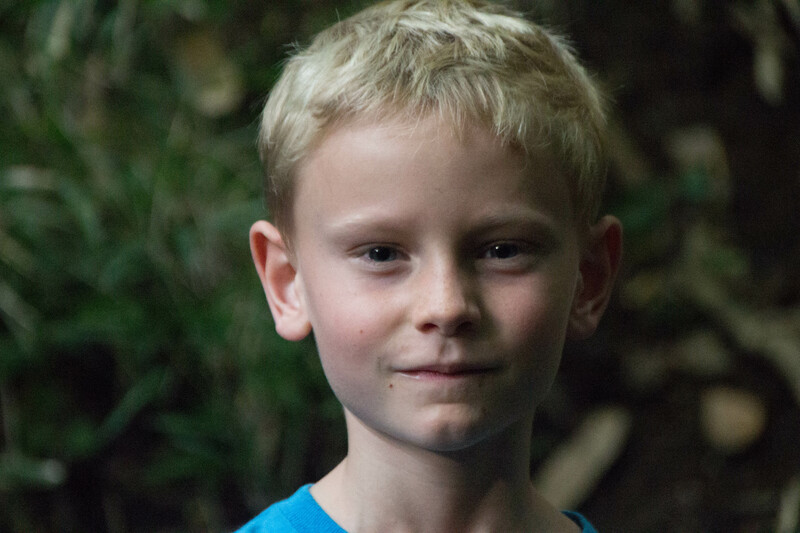 The initially-reluctant kids started to enjoy the babbling brook, the jungle-y vegetation, the slippery mud–all of it. The climb grew steeper and steeper. The kids turned slightly whiny and yet we pushed on. I’m glad we did. 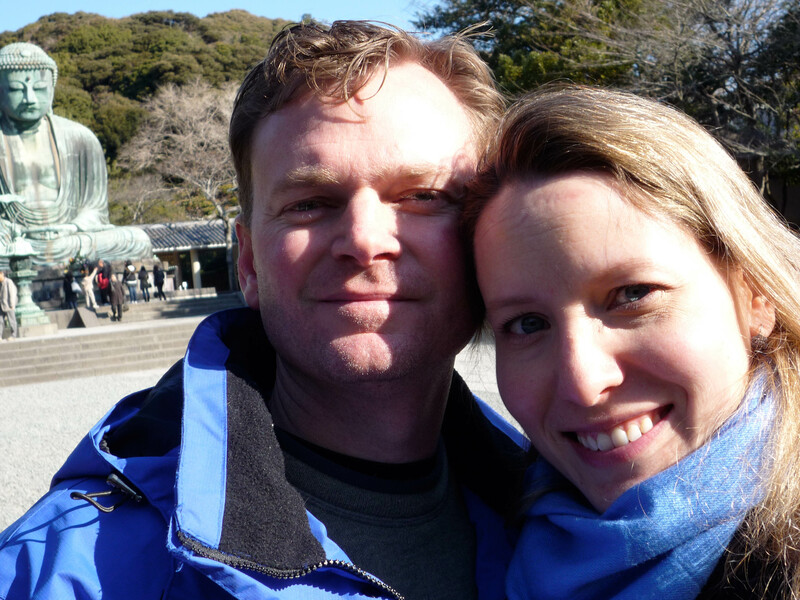 At the top of the hill we enjoyed a beautiful view of Kamakura itself with the ocean behind it. 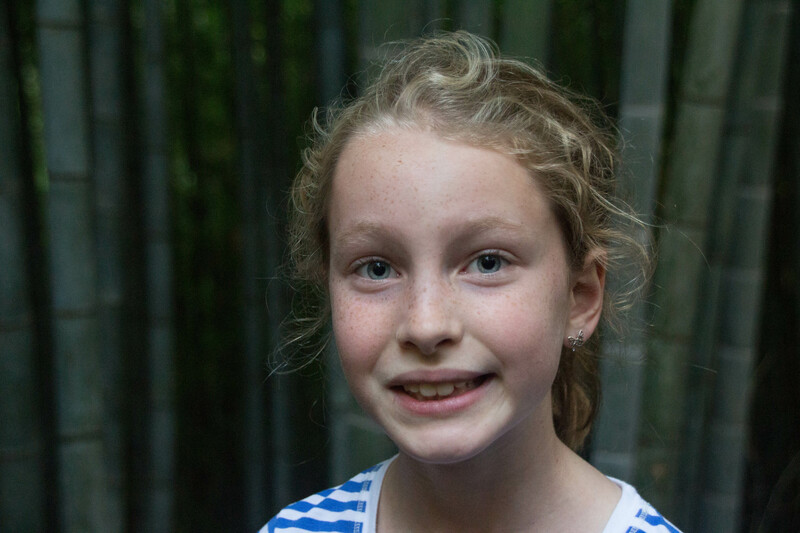 And right around the corner from that vista we found an even better reward–a snack bar! The locals greeted us warmly while enjoying cards, beer, snacks, and smokes. Overhead power lines meant vending machines (always vending machines, everywhere) and a kitchen to cook up local snacks. A happy crowd held court enjoying cards, beer, and snacks–they had clearly been there for a while and showed no signs of leaving soon. As soon as we showed up several Japanese hikers came over to greet us. Several young women zeroed in on Ruby and started exclaiming how “Kawaii!” or cute she is. I busted out my broken Japanese to declare her friendly (“Iko!”) and Ruby greeted one visitor after another. She was quite the rock star. 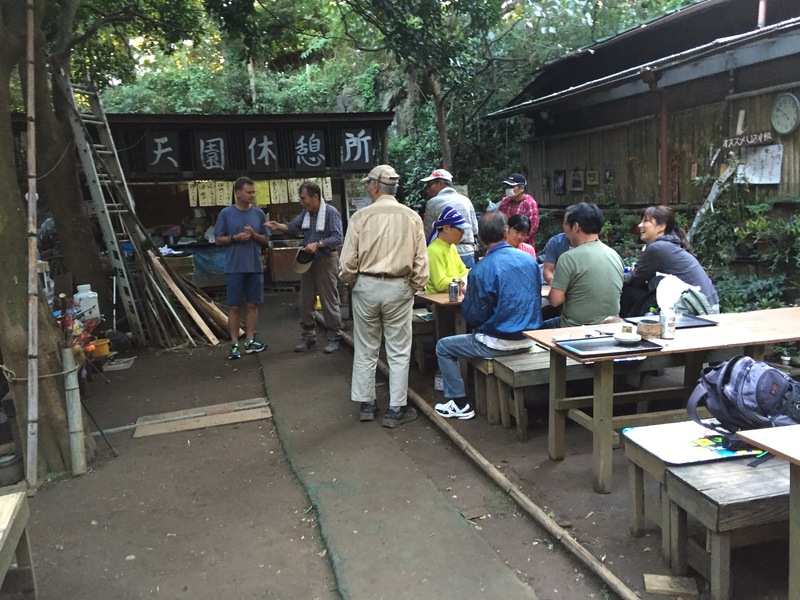 Meanwhile several Japanese hikers who spoke excellent English started quizzing Mark on where we were from, why we were in Japan, and so on. As soon as Mark said that he worked for the Navy, one man grinned and shook his hand and thanked him. Another man spent time in Arlington, Virginia, right near our home in Washington, DC. It was great! Mark decided to show his support for the snack bar and order something to eat. We didn’t really know what was available (again with the kanji! ), so he ordered one of whatever they had. The proprietor looked at him slightly incredulously, but Mark insisted. And that’s how we ended up with mystery noodles (cold) and mystery starchy cakes with brown gravy (warm). The noodles resembled cellophane noodles, though they were slightly wider. The dish looked beautiful, and I expected to enjoy it a lot. It was….OK. The cold broth was slightly goopy and vaguely fishy. 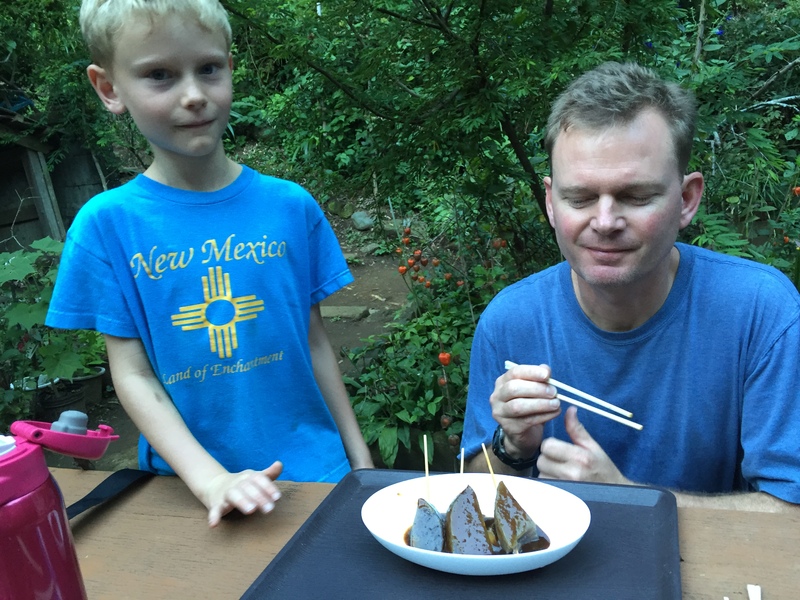 I guessed that it was cooked on dashi, the stock made from kombu seaweed and dried tuna (bonito) that is a staple of Japanese cuisine. I usually love dashi and have made gallons of it in the past, yet somehow the cold version left me…well, cold. 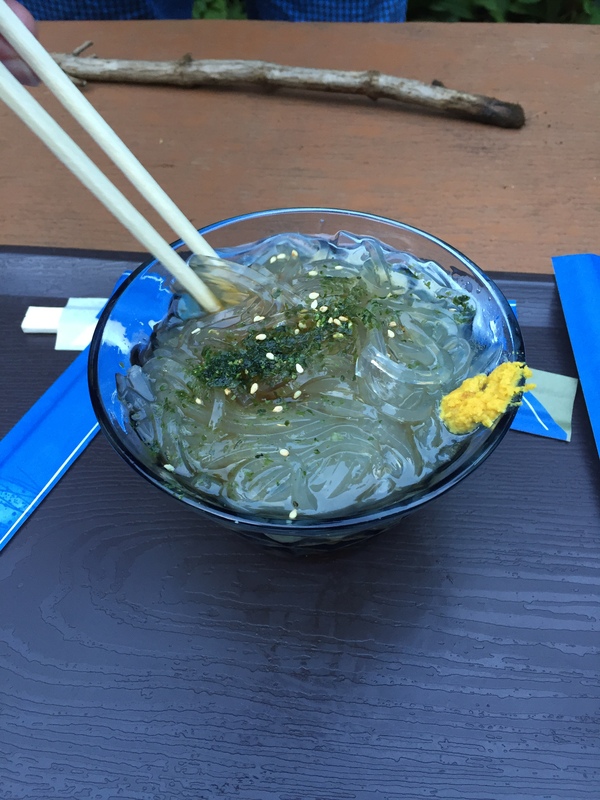 I liked the idea of cold noodles as a refreshing snack after a hot hike. The reality of said noodles–not so much. The other hikers told me the name of the dish more than once but I immediately forgot it. Cy and Mark contemplate the warm, skewered, gravy-covered mystery rice (?) cakes. The second dish consisted of pressed cakes served on skewers with a thick brown sauce that resembled a gravy. The proprietor called the dish Koniaka more than once, and I committed that term to memory. Of course the Google doesn’t bring up any Japanese dishes even close to that name. I liked this dish a little more than the goopy noodles. Not so much that I would order it again, but enough to eat most of it so we looked like grateful customers. By this point the sun started to sink low enough in the sky to get us moving. We bade farewell to our hilltop friends, who continued their vigil of cards, beer, and smokes. We set off downhill and returned to our car just before sunset.